These were the instructions - to draw from life, using a dip pen and ink only, drawing on A2 sized paper. You can't see the whole thing but trust me, I made me look like a pregnant middle-aged baboon. Not just not pretty, which I don't mind, but also not good. Found it hard to see why anyone would choose to use a dip pen and ink to do a portrait. 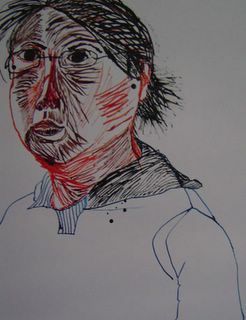 My tutor's comments: I think that your two self-portraits using pen and ink were the two most interesting drawings submitted for assignment 2 (see second attempt at self-portrait for other one he refers to). It is their uncertainty that I like, they seem to me to have an intense engagement with the subject, a searching for the self in external appearances, that is perhaps most evident in self-portraiture. I see you've been going for it. I hate to say this but I actually find drawing with a Bic Medium and Bic Fine can produce realy good effect when shading & cross hatching You would be supprised how much variation in tone you can get from a disposable pen. But you are right ,back in my school days **** years ago, (lets just say last century) I was given pen , pot & inks. Not a nice medium. Don't dismiss anything after one go though. Thanks Sim. I've also been experimenting with fine nibbed markers and felt tips, and my trusty fountain pen and I prefer them all to dip pen. I'm glad I didn't give up though, and who knows, I may still use it in future.